What Are the Dangers of a Codependent Drug Abusing Relationship? When a person is struggling with addiction to drugs or alcohol, family and other close relationships can be vital in helping the person to overcome the addiction, providing emotional support, motivation, and practical help throughout the treatment and recovery process. However, some relationships can have the opposite effect, resulting in increased potential that the individual will either never get help or relapse even after receiving effective, research-based treatment. Codependency is one of the relationship issues that can lead to these results. When a person is struggling with addiction or substance abuse, having a loved one who is codependent can make it more challenging to quit. In addition, the codependent individual can make it difficult to stick to the post-treatment plan, resulting in relapse and a return to destructive, drug-abusing behavior. As described in an article from Psych Central, codependency defines a relationship in which one partner has extreme physical or emotional needs, and the other partner spends most of their time responding to those needs, often to the detriment of the codependent partner’s life, activities, and other relationships. Codependency can result in a difficult spiral in which the codependent partner cares for and enables the loved one’s challenges, making it easier for the loved one to maintain the challenging or destructive behaviors. Low self-esteem: The codependent person may feel unlovable outside of the relationship role and depends on the opinions of other people to feel personal, positive self-worth. People-pleasing: The opinions of other people have a great deal of weight for the codependent individual. This person will do anything to make sure others have a positive opinion of them. The person may feel intense guilt or an inability to say “no” to others. Caretaking: The person feels a primary need to care for others, often at the expense of self-care; in extreme situations, the person doesn’t feel secure or comfortable unless needed. Unhealthy, or absence of, boundaries: The codependent person may not have a sense of boundaries, either for oneself or others. These individuals may offer unwanted advice, feel responsible for other people’s feelings, or want to manipulate or control others in order to feel secure. Obsession with relationships: Because the codependent person feels defined by relationships, they may become an obsessive focus for the individual; on the other hand, actual relationships may lack emotional intimacy. The codependent partner in the relationship is not necessarily a spouse. In fact, Psychology Today explains how to recognize codependent behavior in children. 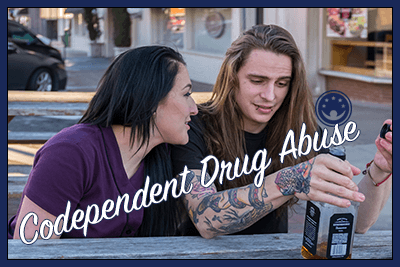 Often, children of people who are addicted to drugs and alcohol become codependent, especially when an addiction has gone so far that the child feels the need to take on a caretaker role with the parent. Codependency generally results in the individual working so hard to care for the addicted loved one that the codependent individual’s needs are neglected, which can also result in poor health, low self-esteem, depression, and other mental and physical consequences. As for the person struggling with substance abuse, the codependent relationship can also have severe consequences on the addiction itself as well as on potential treatment outcomes. First and foremost, the codependent relationship serves as an enabling influence in the person’s life. The codependent person may want to help their loved one, but at the same time, they may subconsciously fear that the other person won’t need the codependent person any more if the addiction is resolved. This tends to thwart any truly effective attempts to get help, leaving the loved one continuing to struggle with addiction and with the physical and mental health risks it creates. A study from the International Journal of Culture and Mental Health states that this factor can also be a risk if treatment is undertaken. Because the codependent partner feels dependent on the addiction to maintain the relationship, returning to the relationship as usual after treatment can actually increase the risk of relapse for the addicted partner. For this reason, codependence should be considered as part of the individual’s treatment plan when the person enters a rehab program. Because of the issues described above, when a person who is struggling with addiction is also in a codependent relationship, this should be taken into account for treatment. There are elements of research-based treatment programs that can help both partners in the codependent relationship; for example, a study from Substance Abuse and Misuse demonstrates that having addiction treatment professionals work with the addicted person’s family members to modify codependent behaviors can have lasting effects even after addiction treatment is completed. In more severe cases of codependency, it can be helpful for the codependent partner to seek their own treatment program. Psychiatric professionals can provide behavioral and personal therapy to improve the codependent individual’s self-image and ability to set goals, define needs, and draw boundaries that make it possible to have a stronger sense of self-worth, deeper emotional intimacy, and healthier relationships. What Is Family Medical Leave? One of the most important elements of treating codependency in drug abuse is learning how to set boundaries. For both the person struggling with substance abuse and the codependent partner, setting boundaries can help to restore a healthier relationship and, in turn, make it more likely that both partners can recover from the challenges of a codependent, drug-abusing relationship. By learning to establish boundaries, the codependent person and the drug-addicted person can learn how to create a healthier relationship, making it more likely that treatment will have a positive outcome for both partners. When seeking help for substance abuse or addiction, a reputable, full-service treatment program can provide individualized treatment plans that can help with the challenges created by codependency. Through research-based methods, these plans can help the individual struggling with addiction to learn to navigate the obstacles that arise from codependency, creating a higher likelihood that the person will be able to maintain long-term recovery. In addition, these types of programs can provide resources to help the codependent family member get control over codependency, learning not only to set boundaries and provide healthy support for the addicted partner, but also to improve self-esteem and healthy relationship values.